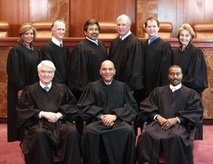 CHRYSLER INSURANCE COMPANY v. GREENSPOINT DODGE OF HOUSTON, INC. This case was waiting for a possible rehearing motion between December 16, 2009 and February 9, 2010. 2009-12-11 Motion for Rehearing - Disposed Denied with Justice not sitting. This case was pending on merits briefs between June 17, 2009 and October 30, 2009. This case was waiting for a decision about briefing or a possible grant between January 30, 2009 and March 30, 2009.